3ATI, 4" DEEP CLAMP This clamp is a ARINC 408 3ATI Square Clamp that is 4 inches deep. It is Chem-Filmed per MIL-DTL-5541, Type 1, Class 1A, Yellow. 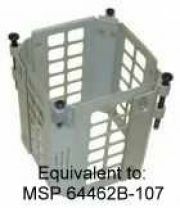 It has stainless steel 6-32 pan head mounting screws and 8-32 pan head adjusting screws that are long enough to accommodate a .500 thick panel.